Free Gloves & Goggles! Oversize Tires - Fully Automatic Transmission - Disc Brakes - Speed Limiter Controls - Electric Model Also Available! FAST SHIPPING! / Lowest Price Guaranteed!! / FREE MX Gloves & Goggles!!! This awesome single seat Go Kart is the ultimate kids ride! Great for driveway and backyard fun, Speed through dirt trails with ease. Comes standard with a full suspension, rear Disc brakes and large knobby tires, this Go Kart is the perfect starter Kart! Size: 55" X 34 X 25"
The Mini-Sport Kart comes with a heavy gauge powder coated tubular steel frame. 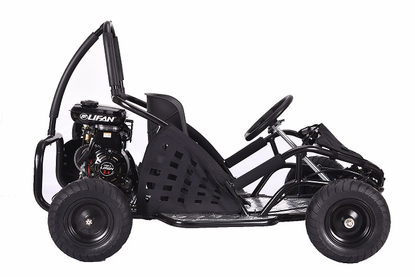 This Off Road Racer offers a rugged steel frame and this Go Kart is an exciting ride for kids! Parental supervision is made easy using the speed limiter control for use during the learning process. Safety is provided for by the roll bar, disc brakes, seat belt, and speed control. Helmets should be worn. This model is legal in 50 states. This unit is Legal for California. - Best age: 13 yrs and older. Here is all the free stuff you get when you buy a powersports vehicle from us! 1. Fast Shipping on all vehicles. 4. Free Manufacture Warranty! . 5. Free Lifetime Tech Support from our Certified Mechanics. 8. Free MSO (Title) for vehicle registration. 9. Fast low cost shipping only $195 to your door! This Model is warrantied to the original purchaser for 60 days on parts. During the 60 day period, the factory will cover the cost of replacement parts and shipping. After the 60 days, the customer will be responsible for the cost of parts & shipping. Failure to follow instructions or warnings stated on the product or owners manual will void the warranty. Bumper to Bumper: The Factory offers a 60-day warranty on small parts. This excludes cosmetic damage such as the plastic body covers (which should be claimed within 3 business days) and tires. This warranty does not cover normal wear and tear, damage or loss caused by misuse, accident, water damage, or stunt riding. Failure to follow instructions or warnings stated on the product or owners manual will void the warranty.